Hey all! 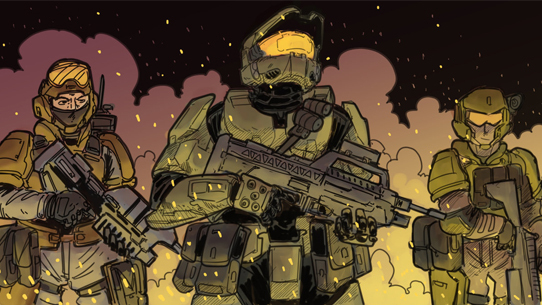 We’re back with a super quick catch-up on some current and upcoming Halo happenings. We’re gonna rifle through these pretty quick, so huddle up and hang on. 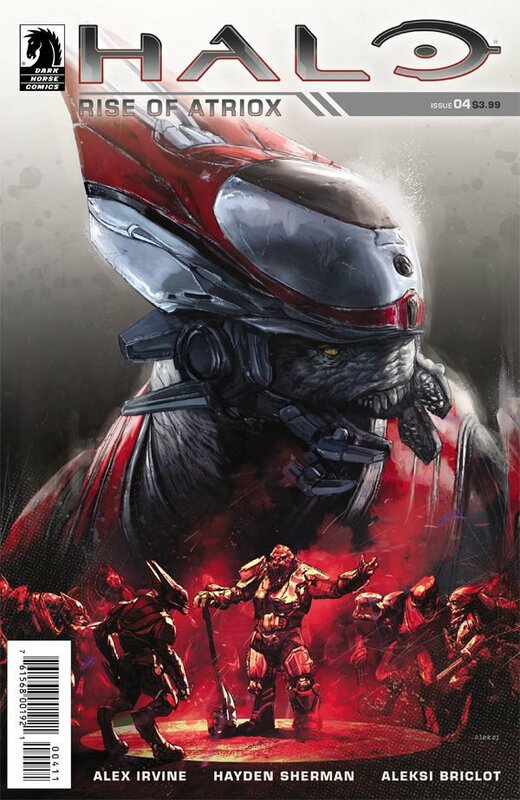 It’s the penultimate installation in the five-issue arc – make sure you grab your copy! Before we move on, let’s check in with ske7ch, who is in the trenches gathering vital development deets for ongoing Halo 5 tweaks. Over to you! Since the release of the “Overtime” update for Halo 5, the 343 team has been working on addressing a few issues that have been reported by players to help improve the overall game experience. Additionally, the Sandbox team has continued to monitor data and feedback around the weapon changes introduced with the Tuning Update – with extra special attention given to the BR in particular as we’ve heard loud and clear that many players just weren’t enjoying the last round of tweaks (particularly the “spread” and feelings of inconsistency). Today a patch was released for Halo 5 that delivers some key fixes to a few reported issues and also introduces a new iteration of the Battle Rifle that aims to address player feedback. Please note that the Halo 5 Local Server app will require an update as well in order to maintain compatibility with Halo 5. We anticipate this app update will be available a little later this afternoon depending how long it takes to propagate across the Microsoft Store. Of all the weapons that were tested and tuned for Halo 5, none have been more controversial than the Battle Rifle. If you recall, the goals behind the BR changes stemmed from a desire to better distinguish the BR as a mid-range weapon and raise the skill ceiling slightly. Following the public tuning test, the team went back again to address feelings of inconsistency and sentiment that it wasn’t “fun” to use, which was reflected in the version that shipped on Nov. 2. You can read all about the evolution and changes to the BR in our original weapon tuning blog HERE. While bullet grouping tightness was improved between the public test and the final version last month, the feedback has continued to be very clear and consistent – most Halo 5 players don’t want the feeling of randomness or inconsistency with their BR. To that end, the Sandbox team has completely removed the “spread” in the BR with today’s update. However, there’s still a desire to help address issues of the BR over-performing outside of its intended range (beyond the changes that have already been made to red-reticule-range, burst fire speed, etc. ), so an adjustment has been made to the vertical recoil of the weapon. Since this is still a different feel and mechanic from the original Halo 5 default BR, we expect it will still cause some ruckus amongst some players. These changes will give the BR a bit of a different feel, but the recoil itself is consistent and predictable, and can be learned and accounted for – whereas the inconsistency of previous spread tuning could not. Give it shot, try to keep a somewhat open mind, and let us know what you think! Lastly, the minor damage increase noted above is one of the levers the team is using to address feedback that the BR feels inconsistent. This change won’t alter the BR’s shots-to-kill values, but in practice the change will bolster the weapon’s finishing or clean-up capabilities on weakened opponents. The team will of course continue to monitor the game closely, and there are still a few player-reported issues being investigated for potential future updates. Please keep us posted on your Halo 5 experience this holiday season, and we’d love to hear if you experience any of the issues noted above following the installation of the patch. With regards to weapon tuning, the Sandbox team is going to regroup and evaluate the latest game data after the holidays to see how the weapon tuning adjustments are working out, and if further iteration might be needed. Please keep sharing your feedback with us here on Waypont, particularly around this latest version of the Battle Rifle. Thanks, ske7ch! Late last week, we announced an awesome new little crossover with our friends next door at Turn 10. Coming very soon, you’ll be able to outfit yourself with some awesome Halo-themed Driver Gear in Forza Motorsport 7, and all you have to do is play (or have played) some Halo on Xbox One. There are three pieces of Driver Gear in total – the Halo-branded kit you see below can be acquired simply by having played either Halo 5, MCC, or Halo Wars 2 on Xbox One before Nov. 30, 2017. Codes will start being sent out via Xbox Live message beginning Dec. 15, 2017. 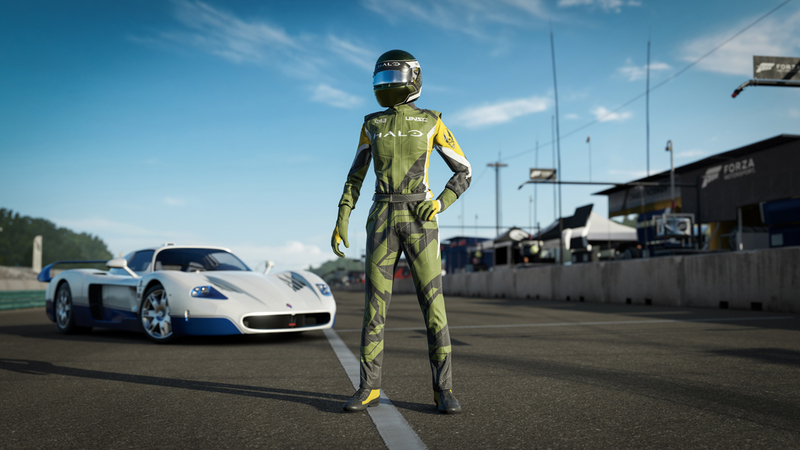 Additionally, there are Mjolnir-themed driver suits based on the Master Chief and Spartan Vale’s armor that can be earned by playing specific events in Forza Motorsport 7. You can check out all the finer details in our full announce blog right HERE. Oh, and say hello to my taillights when you jump into Forza. This Thursday, Dec. 14 at 3PM PT, we’ll be hitting the airwaves with a small celebratory Livestream to recap another crazy year in Halo. 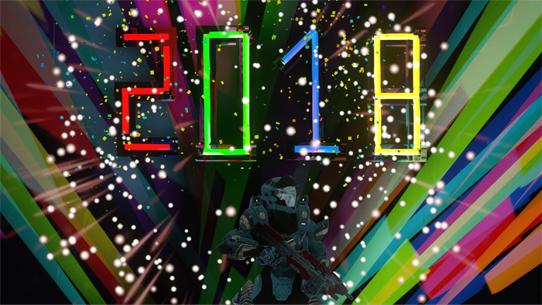 We’ll be giving a bit of year-in-review, talking about some of our favorite things, dangerously skirting professional protocols, and overall having a great time chatting Halo with you fine folks. Join us at mixer.com/halo for both the broadcast and a fun Community Playdate immediately after. See you then! First up is BaileyJIII with this really rad render. Love it! Next up is LettsProps with the awesome HAZOP cosplay, obviously good for weathering any climate. Our friends at Grifball Hub celebrated their 10th anniversary. Congrats to them on an incredible milestone! Rythaze recently shared some ridiculously awesome sketches they've made, like the one you see below. So sick! 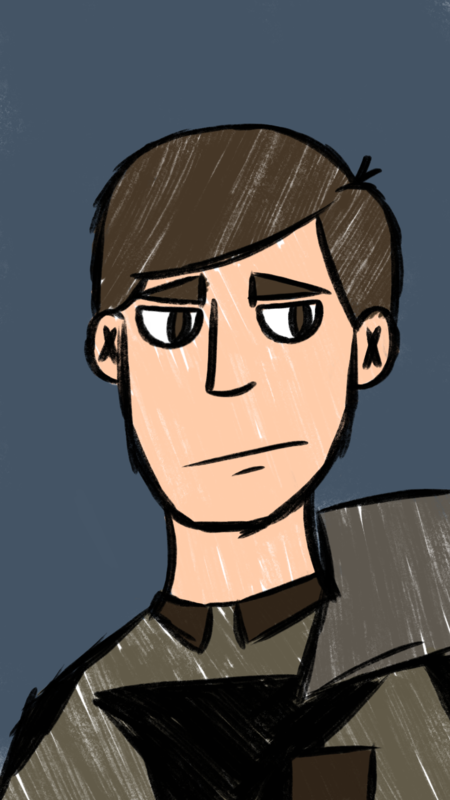 Speaking of cool drawings, I really liked this simple Lasky sketch from S3xyTrap. This mosaic tile board is pretty jaw-dropping. Then again, so are these awesome graphics showing off different Spartan generations. Love the treatment! Luke the Notable started a cool video series where he looks at the alien enemies throughout the Halo series trying to determine where they've appeared the strongest. Check out the episode on the Elites below, and see if you share his rankings! And in the holiday spirit, don't miss this Halo 5 Christmas Dualtage by Daedric & Fatbass. Good stuff! Hello Halo community! Our Halo space combat mod Sins of the Prophets for the RTS game Sins of a Solar Empire is currently competing in ModDB's "Mod of the Year" contest. Thanks to our dedicated fans we've passed the first round of voting and made it into the Top 100 mods category, where we are competing with the best mods across the gaming community. As we're the only Halo mod of any kind in this year's running, we're asking for your support to give Halo a solid showing. Following the link below will take you directly to the voting page with Sins of the Prophets already selected, you just need to click the "VOTE" button to put us one step closer to victory. Also, we've just released version 0.88 of the mod and we'd love for you to check it out! It includes new ships from Halo: Warfleet like the Gladius and Storm Cutter, as well as updated models for the Covenant Assault Carrier and Phoenix-class Support Ship. You can check out more about their project here, and check out their awesome model of the UNSC Gladius-class heavy corvette – first revealed and visualized in Halo: Warfleet! Before we close out, one note: don't forget that beginning Thursday morning, Oddball will be added into the HaloWC Preview playlist in Halo 5. Make sure you jump in and try it out! That will do it for us this time around. From yours truly, I hope you have a very Merry Christmas, Happy Holidays, a kicking New Years, and a rad time with anything else you happen to celebrate. See you on stream! 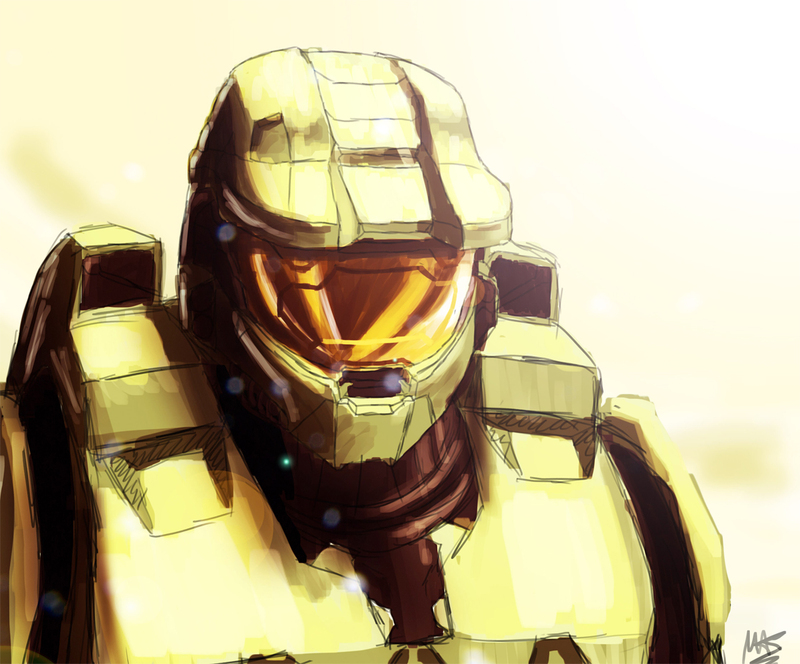 Until next time… Live well, play Halo, and focus on family – in all its forms. 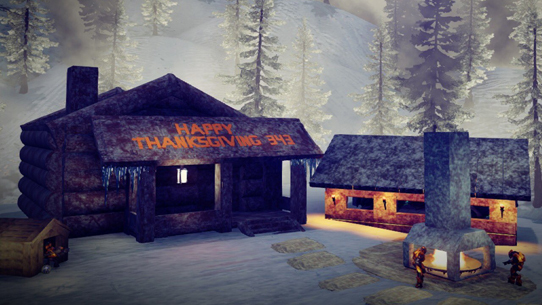 Happy Turkey Day return, Halo friends and family. Today we’ve got a quick catch-up on some of the latest news and notes from around the community. It’s a bit of a light touch today, but there’s certainly still some key points to ponder, so let’s get to it. Welcome back! To be frank (or Grim, really), I’m not sure if that’s a welcome back to us, or you guys, but let’s go with it either way. 2018 has arrived and with it, the promise of new fun times to be had and adventures to be embarked upon. No, not those adventures, but plenty of exciting ones regardless – some which might surprise you more than others. We’ve got a few things to catch you up on this week, so let’s check out what’s been going on lately. Hey all, back in the saddle for another Halo Community Update. Today looks to be a more brief visit than the multi-thousand word novellas we’ve been pumping out as of late, but hopefully no less fun. And speaking of novels, we’ve got a new one freshly released this week, along with some new playlist goodness, yet another birthday to celebrate, and more. Read on!